Now first time in finnish and in english! 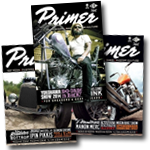 Helsinki Bike Show | Masterson Kustoms | Do-Dads Is Back! | Yokohama Mooneyes Hot Rod & Custom Show 2014 | Helsinki Ink 2014. Size: 21 x 15 cm, 74 pages.